Habit at Resort Management Group Nursery Kihei, Maui, Hawaii (USA). February 09, 2011. Origin and Habitat: Eastern Queensland, Northern Australia. Altitude: Elevation range from near sea level to 900 metres. 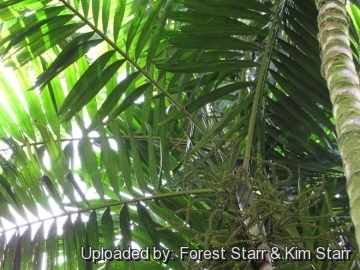 Habitat: Grows as an understory plant in coastal and upland moist tropical rainforest. Ptychosperma elegans var. sphaerocarpum Becc. 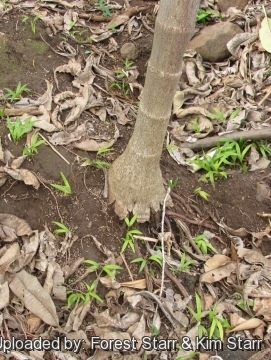 Description: Ptychosperma elegans is one of the few Ptychosperma species with solitary trunk, (most sucker). It flowers and fruits when still small. Trunk: Slender 10-12 cm in diameter and up to 15 metres of height (but often less than 10 m tall in cultivation), bulging at the base, green in the younger part and greyish or almost white in the older one with dark leaf base scars that encircle the trunk and lighten in colour with age. Crown: It carries a small head of semi-erect whorl of fronds. Crownshaft: The foliar base wraps entirely the top of the trunk for a length of 40-50 cm forming an olive-green crownshaft. The crownshaft has a bulging base and smooth waxy surface. Leaves: Up to to 3(-3,3) metres long, pinnately compound, reduplicate, arching leaves with 30-60 wide premorse leaflets (indented at the ends in the typical Ptychosperma fashion), narrowly oblong, widest toward the middle, opposite from one another on the rachis, in a single plane, displaying a "V" shaped appearance, long even 1 metre in the median part, glossy intense green on the topside and grey-green on the underside. Petiole 30 cm long. Inflorescence: 60-100 cm long pendulous under the leaves just below the crownshaft, green-yellow heavily branched to two or three orders. Flowers three-petaled, unisexual borne on the same inflorescence, cream-green, in triad (a feminine flower between two masculine ones). Male flowers1.5-2 mm long, whitish to light green with 12-22 per flower (the female parts are developed but the ovules are absent in the male flowers). Female flowers whithis-green. Fruit: Globose to ellipsoid, 9-15 mm of length, 8-10 mm diameter, bright red when mature and have remnants of the stigma at the apex. Seed: 10-11 mm long, 5-angled. Endosperm deeply ruminate. Seedlings: First pair of leaves compound with two sessile, longitudinally veined leaflets up to 7 cm long. 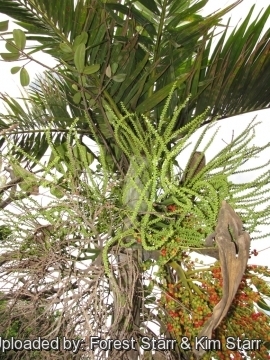 Remarks: Ptychosperma elegans may be confused with Ptychosperma macarthurii, but it is a smaller statured, clustering palm with drooping rather than ascending leaflets. 1) Wikipedia contributors. "Ptychosperma elegans." Wikipedia, The Free Encyclopedia. Wikipedia, The Free Encyclopedia, 7 Jun. 2014. Web. 8 Sep. 2014. 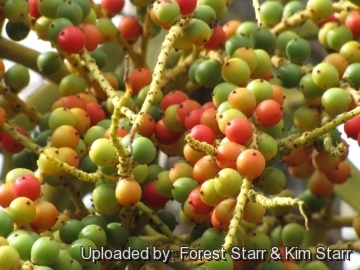 2) Forest & Kim Starr Ptychosperma elegans (Solitaire palm). Plants of Hawaii. <http://www.starrenvironmental.com>. Downloaded on 21 August 2014. 6) Gledhill, D. “The names of plants” (2nd ed.). Cambridge: Cambridge University Press1989. 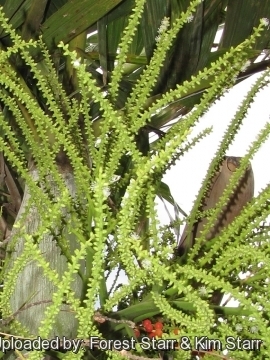 10) Heather V. Quintana, Michael G. Andreu, Melissa H. Friedman, and Mary McKenzie “Ptychosperma elegans, Solitaire Palm” FOR 251, School of Forest Resources and Conservation, Florida Cooperative Extension Service, Institute of Food and Agricultural Sciences, University of Florida. <http://edis.ifas.ufl.edu> Reviewed April 2013. 11) White, Alan. “Palms and Cycads.” 1988. 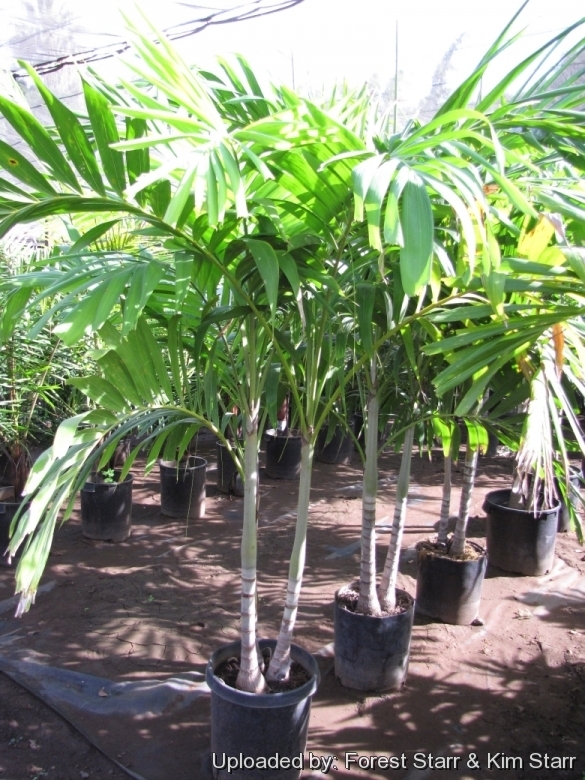 Cultivation and Propagation: This palm is an excellent pretty fast growing garden plant adapt to different tropical climates. It is also one of the most elegant indoor palms. Soil requirements: It prefers well-drained fertile, organic, nutrient-laden soils except those that are constantly soggy. However it is widely adaptable including those that are neutral, acidic, clayey and slightly alkaline. Watering: It prefers regular waterings and should be watered before the soil completely dries. Don't let sit in water. Indoor, potted Ptychosperma should not be over-watered. They may contract the fungus Phytophthora, if over-watered. Light: Outside they grow best in half sun and tolerating direct sun only after about five years old. Young specimens need protection from direct sunlight and grow best in shady to partly shady locations. If home-grown, they look their best in bright diffuse light. Wind tolerance: Keep out of high, drying cold winds. Garden uses: It is grown in open air, in the sub tropical and warm-temperate zones, for the decoration of parks and gardens, in a partly shaded location when young, and regularly watered. Because of its reduced size and its elegant look, the Ptychosperma elegans proves to be particularly suitable for its utilization in patios and in great open inner courts. It has a fairly good employment, in pot, for indoor decoration. Disease & Pests: It is quite resistant to pests but may require regular fertilization to prevent yellowing caused by potassium deficiencies; protect against spider mites, scale insects. Protect from frost. Propagation: By seeds that germinate well in 2-3 months and are readily available.